I can only imagine that it was a clever Facebook advert that hooked me onto this one! When my little one was just a few weeks old, a company called MOM was brought to my attention- Moms Own Milk. This is a WAHM (an acronym I learnt recently- Work At Home Mum) who makes resin and silver jewellery made from your own breast milk. Now I am totally aware that some people will (and do) find the thought of this either pointless or disgusting- and if that’s you please feel free to move along and not read this review! Everyone is entitled to their own opinions, and I certainly have a few of my own…. My little boy didn’t have an easy start to breastfeeding- it took him three long weeks to get the hang of it. I say long weeks- it felt like years passed and I aged another decade eachtime we tried and failed to get him latched on. Eventually he got the hang of it, and that was that. He hasn’t looked back since and at about 8 weeks old started refusing to take a bottle. 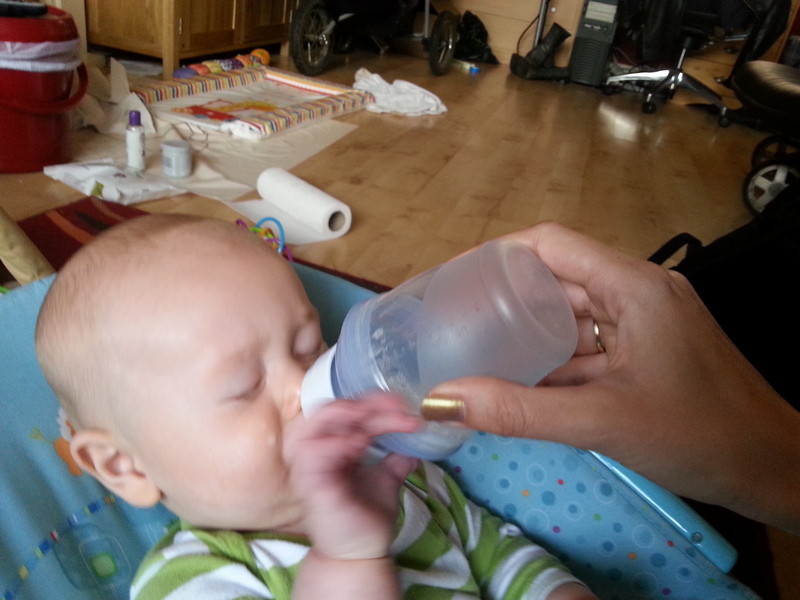 We have successfully got about 10 oz total into him via a bottle since that date over numerous occasions. I went back to work three weeks ago, part time. It wasn’t a “hard” decision- I’ve had a wonderful year at home with my little scamp (not to say it hasn’t been trying and stressful at times), but I enjoy my job, love my employers and it was time to regain a little “me time”. Even if this is a 20 minute walk to the station by myself, a quiet train journey or eating lunch without having to sweep and mop the floor afterwards- it’s still me time. This was however reasonably stressful as baby still refuses milk from anything except the breast. He doesn’t eat or porrige with milk (fussy little so and so), and he wont drink milk from a tippy cup, open cup, straw cup or any other kind of recepticle. So the 10 hours he is at the childminders 10 days a month means 10 hours a day without any milk. We’ve tried breast milk and cows milk- cold, warm, hot- nothing is good enough! So my first fear was that he’d starve. When I realised he was actually fine without milk for numerous hours, it actually made me a little sad. Although it’s frustrating being the ONLY person in the whole world (well ok, in our small world) who can give him the nutrition and comfort he needs, there’s a lot to be said for the breastfeeding (or in American “nursing”) relationship with your baby. Whilst I can’t describe what it’s like to have the bottle feeding relationship, I can say that breastfeeding despite everything is a wonderful heartwarming sensation every single time. It’s very emotional, and really has helped me bond with my lovely little person. So I really wanted something to commemorate that relationship and couldn’t really think what that one thing might be. I plan to feed my baby directly from the breast until he self weans- who knows when that might be but I guess he may feed until three or so, but I still wanted something for when I was at work to look at and remind me of that relationship. So MOM seemed perfect. Althought the website is a little flashy, and I found it hard to navigate, Vickie’s comms were great, even when I sent her a long rambling email about what it was I wanted. Having said all this, today I’ve visited the website with it’s all NEW look, and found it much easier to navigate to find what I was looking for! 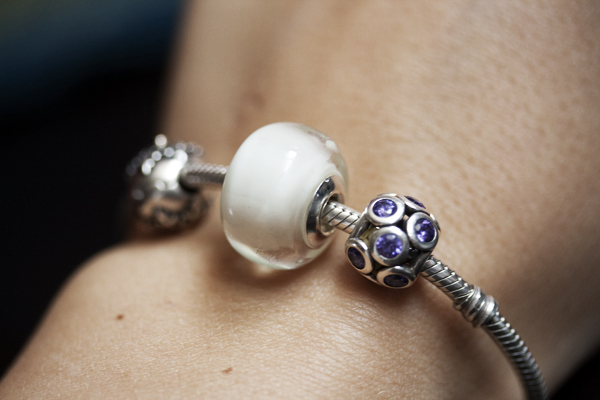 I have a Pandora bracelet which was a present from my sister for being her bridesmaid. Up until now it has only had the two charms she gave me on it (Birthday and Christmas are on their way!!) 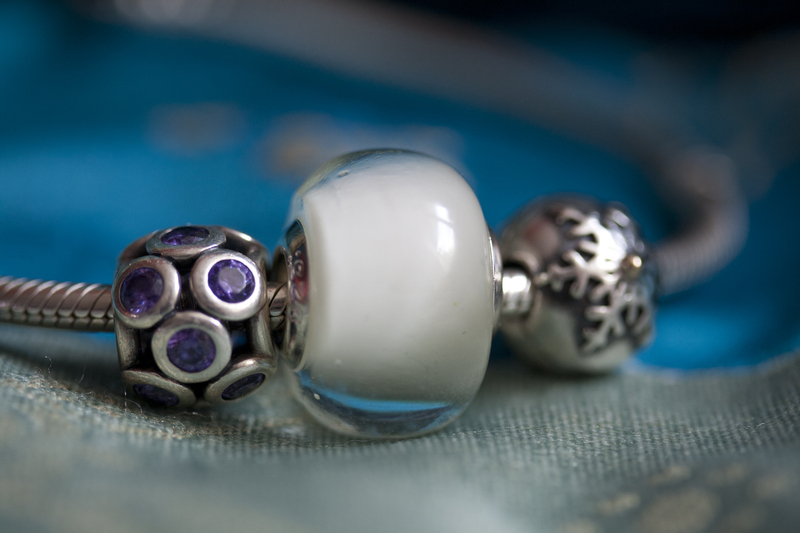 so I decided a Pandora style bead would be perfect. In all honesty, they are one of the only things from the website that is my style, but there’s something for everyone with a wide range of different things. You can add all kinds of things to the jewellery- from umbillical cord, to the first hair curl or placentra, but I was just after straight Milk. 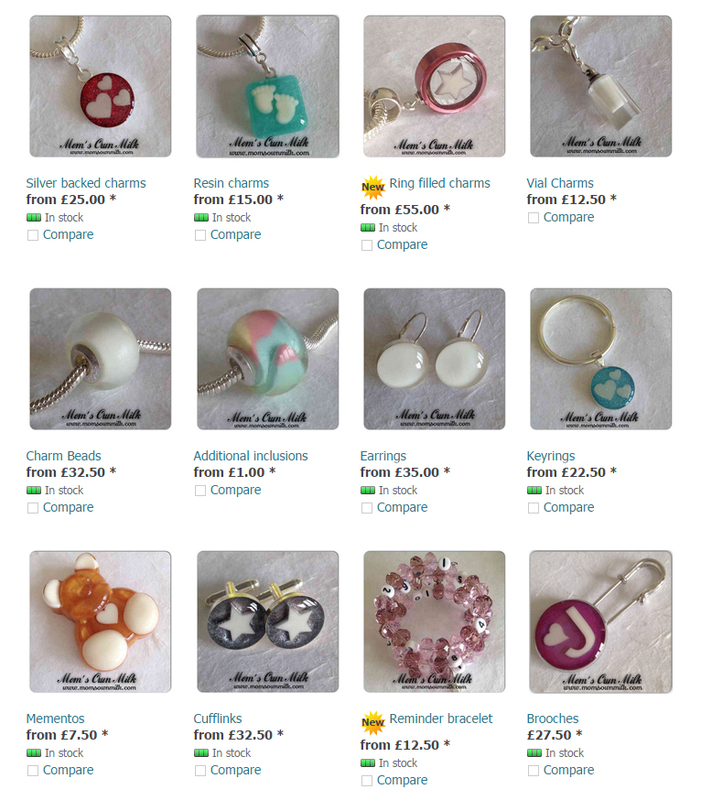 Vickie responded quickly to my enquiry about what style and size bead I could have and I placed my order at once. Within 30 minutes I received the information about how to package and send my milk with a confirmation of my order. I happened to be popping out that afternoon so I posed a small freezer bag of milk (30ml) (double bagged to avoid leaks) that afternoon. Once Vickie had received the order, she emailed me to let me know, and the same once it had been shipped. I chose a quiet time of year (not just before christmas!) so the turn around was quick- less than a week from me posting the milk to the charm arriving, signed for post. It arrived today, nicely presented in a frosted box, with a free MOM Breast Feeding Wristband (which you can turn inside out to show either a L or a R to show which side to feed from next), and came with a vial of resin and jewellery polish. Instructions are available on the website about how to care for it too. And…. it’s lovely! Exactly how I pictured it (the website images are very clear and accurate) and it looks great with my two current charms. It’s a little bigger than would have been ideal for me, but I wanted the smooth finish and that only comes in the 17mm bead whereas you can get a multifaceted geometric shaped bead in a smaller 13mm. Having said that it looks really good with my current bracelet in the size it is so what do I know?! So all in all- great service, lovely item and something really special that I can look at whilst at work or away to remind my of my beautiful baby boy! I’m totally ready for baby D to drop now! Everything is squeezed up so high I’ve struggled to eat a full meal and am definitely not managing to get in the calories I should be eating at this stage. I either get indigestion or heartburn/acid reflux. Sometimes all the above if I’m really lucky. This is making sleeping quite hard at this point- I’m not getting to sleep until well after midnight at the moment which is very unlike me (I’m a bed by 10pm latest kinda girl). At the other end of the night is my issue with carpal tunnel. When I turn over in the night or go for a drink of water, my hands just don’t work. I have to grip the blanket with my thumb and forefinger and I can’t bend my fingers around the water bottle. So sleeping doesn’t work too well at the moment. I’m 36 weeks tomorrow, so I’m sure baby will drop down over the next two weeks or so. We had one more wedding this weekend, and now all the weddings are finished! Here’s the bump at each of the five weddings! I think the moral of that one is that you can’t always see the bump from the front! Even *cheap* maternity fashion exists too! I’ve been lucky enough that some good friends of mine lent me a couple of bags of matenity wear, so I’m sorted for work. But I’ve got a lot of weddings to go to this year. And I plan to look my best (no matter how huge, heaving, swollen or sweating I am). Maybe I should have started looking a bit sooner for maternity party dresses for the weddings, but I think I have been pretty successful so far (thanks to TKMAXX, New Look and not caring if I look fat!!). I also share clothing with friends so when we do wardrobe clearouts, we get the first rifle through each others cast-offs bound for the charity shop to get a little more life out of them yet. Kindly G did a clearout recently and found a few bump-suitable things to come my way (thanks!). 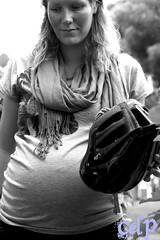 Maternity clothes seem like they should be easy to find. Many women spend a part of their life pregnant (even if it is just 9 months), but sadly most highstreet shops now do not sell maternity wear in store. This includes Next and M&S, and some places have stopped selling it online too. There are of course a number of specialist shops like JojoMamanBebe, Isabella Oliver and the like, but most are way out of any normal human price range! For every day clothes I’ve found New Look (where I haven’t ever really bought clothes since I was about 16) to be fantastic. Their jeans in particular are a decent length, and the tops fit well too. Today I was on the lookout for something to wear for some of the upcoming weddings, and found that the slim cut fit that seems quite in fashion at the moment plus a generous helping of lycra (and the aforementioned lack of concern about whether I look fat or not) has meant that I found two dresses almost instantly in TKMAXX. Which is a good thing as Windsor was horribly busy today and I was tired from an early start and was desperate to get out. I’m not sure *how* stretchy they are, but hopefully they will last a good 8-10 more weeks of sideways growth. I was also talking to people about the maternity fashions even 10 years ago- one did not show off and enjoy the bump even in the 1990’s- it was to be covered up. Reminded me of the pictures in my 1970’s St Michaels Babycare manual that mum gave me….. Thanks Daddy Bump for the previous post… I hope people start being a bit more positive soon! Luckily I’ve been ok so far, but I must admit avoiding conversations with the “competitive mum” types. You can spot them pretty quickly amongst a group of acquaintances. The two obvious ones were those who (whilst I was in my first trimester and being very sick, having just started some antihistamine medication) crowed “HA! You think you’re tired now….”,. Bitterness and bitchiness are ugly traits in men or women. So 19 weeks today with mango baby- one more week and we’re at half way! Blimey. I genuinely can’t believe how round I’m getting, but luckily (through healthy eating, exercise, being healthy to start with and no doubt some luck), the bump is the only place that’s got fatter so far. In the evenings, I feel so full I could pop! Next week is scan week, my next physiotherapy appointment for my dodgy shoulder and then wedding season starts in earnest. I’ve really struggled to find outfits for weddings so far. I’m naturally a warm person, now incubating too. I need nice, comfy maternity dresses which look flashy enough for some of the very posh weddings we’re going to this summer (including visits to the Grand Connaught Rooms in Covent Garden AND the Dorchester!). Unfortunately I am not made of money, so finding outfits has been really hard work. I am by no means in the clear but have a few options now (including some traditionsl indian dress) which will hopefully see me through without me collapsing into a sweaty puddle or wearing something innapropriate for the setting. “six— no sev— no- almost 18 weeks! I just hope the warm weather starts really poking through now as my jackets won’t fit any more soon! We were lucky enough to pick up even more loely second hand stuff from friends this week! Very grateful for the breast pump (not beastpump as I just typed), steraliser, toys, clothes and car mirror for rear facing seat plus a great sling we grabbed from a friend (and got to hug a lovely dog and play with a gorgeous little girl too! Biggest achievement this week (last week now) was making my GORGEOUS niece smile via skype playing peekaboo with her! Had the 16 week midwife appt last week too. Baby fine, my bloods all fine (though I’m Rhesus negative) and babies heartbeat most excellent. Baby D does also NOT appreciate being poked by the dopplar, and wriggles and kicks like mad. Still can’t *really* feel it yet, the odd bubble but nothing more. Lets hope soon I will start to feel the squirming! Been on the whole much less nauseous and much more active which has been hard but fun. Even tried out my new maternity swimsuit last week! I have reached 16 weeks pregnancy (which feels like a cheat as I skipped forwards a week). After last week’s wonderful donation (lend) of maternity clothes, I have bought a few extra items. This includes a pair of proper skinny jeans (though I’m not sure they’ve seen any denim), a dress for a family function and a couple of tops for work. It was nice to go and try some maternity clothes on, knowing vaguely what might fit well. Annoyingly, I’m a bit stuck for jumpers etc at the moment. Most my smarter work jumpers and cardies are slim fit and ride up giving me cold bits, and my big chunky jumpers which are perfect for this too-cold weather aren’t really office-suitable. And then we had the pleasure of taking home a large number of baby items, kindly donated by the lovely Tamsin! We now have a moses basket (no stand), a car seat, a play mat, lots of tiny clothes, a number of re-useable nappies and more to come! Very exciting! We spent much of East Monday sorting out the spare rooms (we had computer room/ study and a spare room seperately, they have now been amalgamed together and we now have a baby-room-to-be). Lots of moving furniture, though I let the husband do the Lions share of this (didn’t stop me hurting the next day!) and working out how things are going to be. It’s by no means ready, but is starting to shape up!